Julie is a passionate development practitioner with fifteen years of progressive senior management and organisational development experience in the non-profit sector. Her career has taken her on a journey of lifelong learning. She started this journey in a refugee camp in Uganda as a volunteer with Right To Play, an international NGO using play to educate and empower children and youth to overcome the effects of poverty, conflict and disease. After six years with Right To Play in various roles, Julie took a detour to spend three years at Tennis Canada, the national governing body in Canada for tennis, which happens to be her lifelong hobby. In her role as Director of Community Development, Julie was responsible for spearheading the program design, delivery, promotion, growth, evaluation and funding of all grassroots programs. 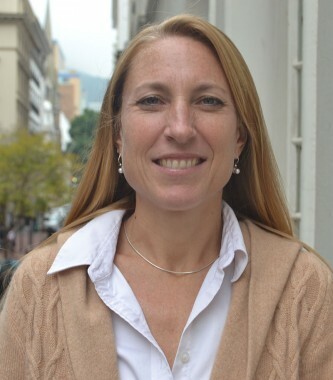 Julie then came to South Africa in 2011 to work with the African Institute for Mathematical Sciences – Next Einstein Initiative, a pan-African network of centres of excellence for training, research and outreach in the mathematical sciences. As the Director of Organisational Learning and Oversight, Julie’s portfolio included grant management, program management and performance measurement, building capacity across the network. Julie was also instrumental in securing major grants from the UK’s DFID and the MasterCard Foundation, as well as a number of smaller funders from the private and public sector. Julie loves fast paced work environments that are led by visionaries who believe in challenging the status quo and pushing the boundaries. She is excited to be joining the Sonke team as the Resource Mobilisation Manager, and to work with the various units to identify funding opportunities that will help achieve the Sonke vision. In her spare time, Julie is either on the tennis court, exploring the beautiful mountain trails of the Western Cape, or struggling to teach her newly-adopted rescue dog how to sit, stay and play fetch.